Paytm UPIFIFTY Coupon – Get Rs 50 Cashback on Adding Rs 5000 or More (Selected Users). 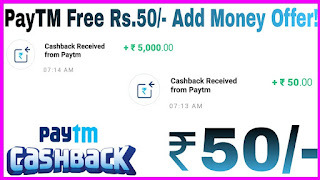 Paytm has come up with an awesome deal for all of You, Get Rs 50 Cashback on add Money of Rs 5000 or more. Offer Valid for Selected users, You cab Check your Eligibility by Applying Coupon code !! 4. Click on Add Money -> Enter Amount of Rs. 3,500 or more -> Click on “Have a Promocode” tab -> Enter “UPIFIFTY” & click on Apply. 5. Once your Coupon get applied Successfully, Make the Payment via UPI (Not valid for Other payment Modes). 6. You will get the Rs 50 Cashback in your Paytm wallet. *Paytm reserves the sole right to change offer terms without any prior notice.